"A culture...which fails to understand that the measure of a civilization is its compassion...condemns itself to death..."
The quote above is excerpted from one of many books by Chris Hedges. To see the full quote, which is a great deal graver, click here. I have read several of his books but not this one, yet. They are not light reading, but give much food for thought, and action. I believe the recent storm Sandy, which is still churning in the Eastern US and Canada, has been a good reminder amidst a grim political circus to show us what is really important. I don't think I have to tell anyone how hard folks have been and are being hit by this storm. I am but a humble artist at the beginning of her career (although not at the beginning of adulthood!) and I do not have a lot of funds to donate but I do have a couple of paintings I can donate the proceeds from to help out. I have a new Daily Painting widget on the blog that will take anyone who is interested to a special auction where 100% of the proceeds (less shipping and payment fees) will go to Guardians of Rescue. So why did I pick them? I know there are plenty of people in need. I also know that help for animals is a bit harder to come by yet no less urgent. Those of us with pets know exactly why other pet owners refuse to leave them in the event of a disaster. Animals are important to us. I follow many animal rescue groups. Several of which have mobilized during the storm to save not only animals, but as in the case of the Natural Disaster Search Dog Foundation, people too. Watching the storm from online and Facebook, I saw that some of the folks in the Guardians of Rescue organization were out during the storm looking for animals in need and making sure that the ones they shelter were safe. Some of them had to pull trees off their cars to try to get the hurt ones they found to emergency care. I already know this group is a hard working and highly dedicated non-profit organization. I wanted to help out the New York and New Jersey chapters as they were the hardest hit. I know that times are hard for many of us and the future uncertain. 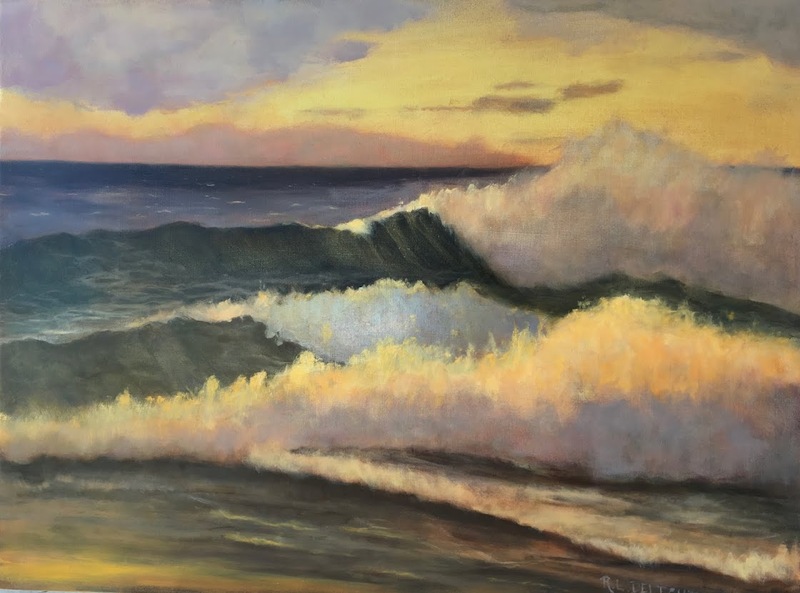 Even if the time isn't right for you, if you know someone who might be interested, please tell them about the Daily Paintworks Hurricane Sandy fundraiser. If they don't like my paintings or who I am donating to, there are several others. The individual artists are able to pick where we want to donate our relief efforts. © 2012 R.L. 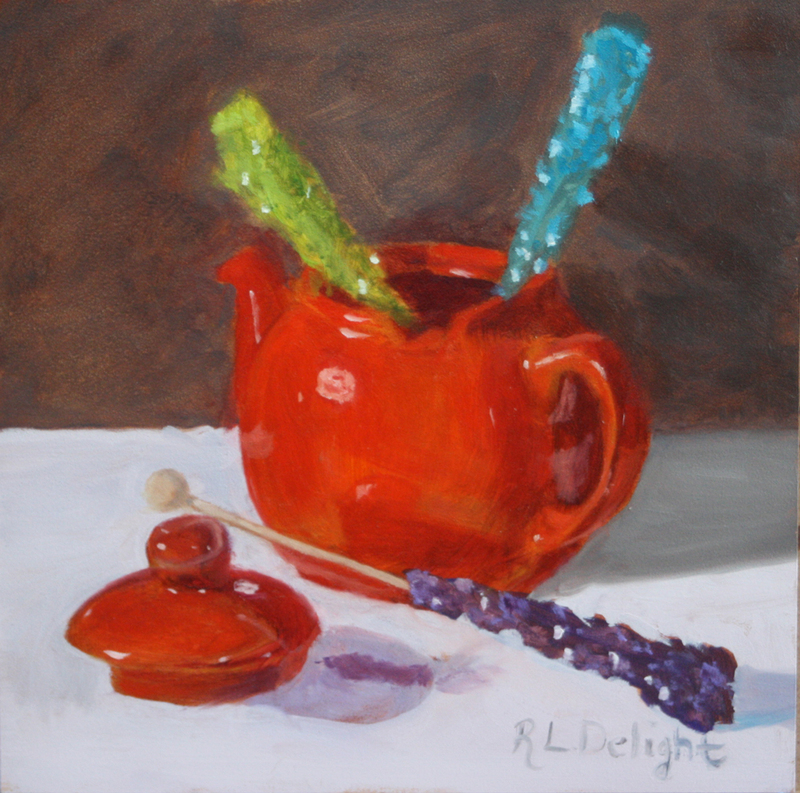 Delight, Sweet Tea, oil on gessobord, 6"x6"
© 2012, R.L. 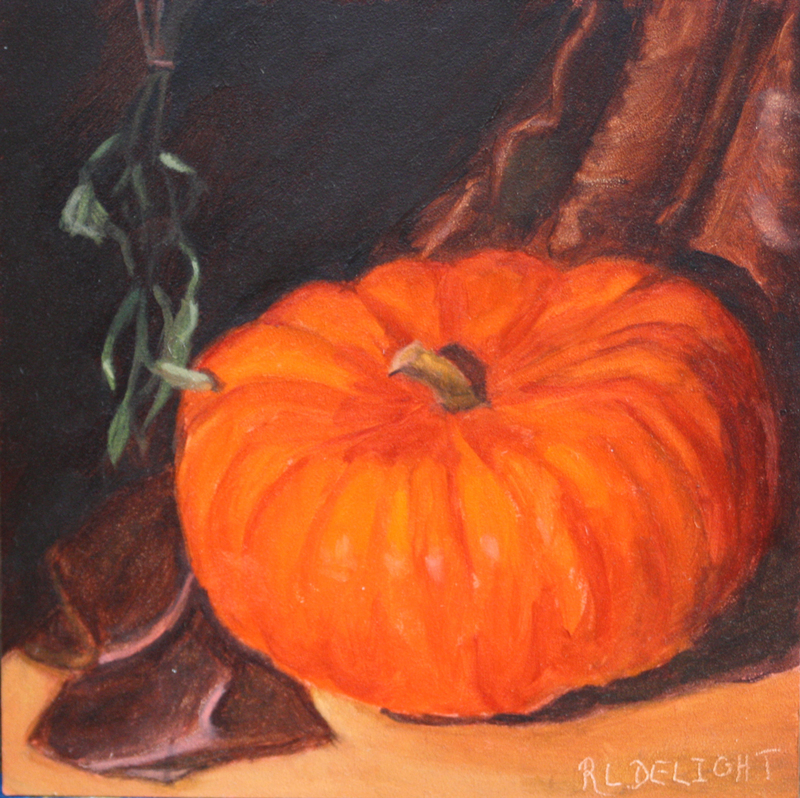 Delight, Pumpkin Sage, oil on gessobord, 6"x6"
Here on the left coast we are experiencing our own stormy weather, gale force winds and heavy rain. Great for working in the studio! I finished my copper painting and will have it on the next post. Until then, thoughts and prayers going out to those in the path of the storm. Stay warm and dry!